We first spotted the turtle high up in the dunes. 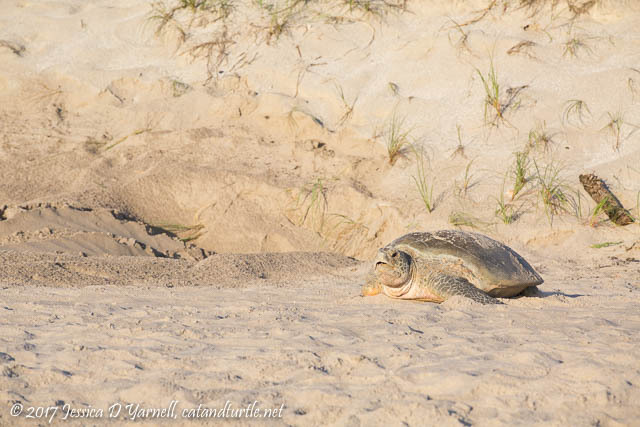 She was throwing sand back as she covered her eggs. That process went on for a little while. All we really saw was her back and the flying sand. Occasionally she’d pick up her head and look at us. We were careful to stay far back. All of these images were taken with a telephoto lens. Finally the turtle started to move away from the nest. That’s when we noticed that she was missing a flipper. 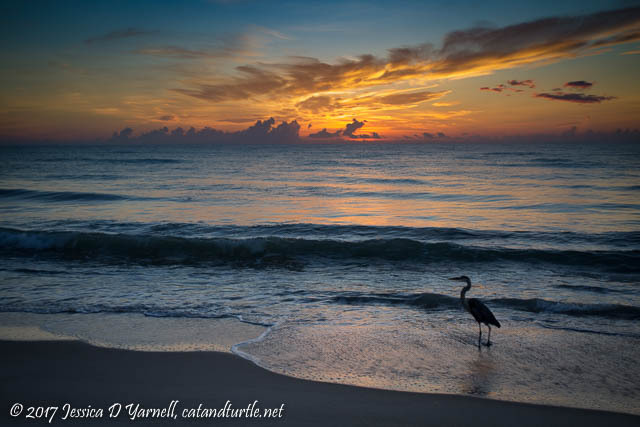 No wonder she was still up on the beach after sunrise. She had to work extra hard to drag herself through the sand. She still managed to get her eggs laid, though. We were impressed. We saw this turtle on July 3, the day before Independence Day. 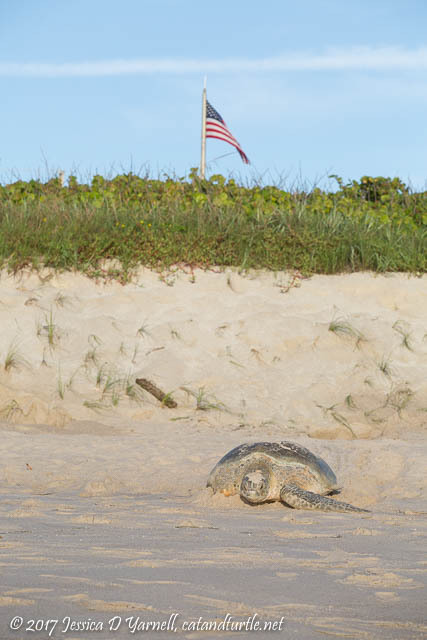 I thought it was cool to see the American flag flying in the background as we watched the turtle make her way down the beach. 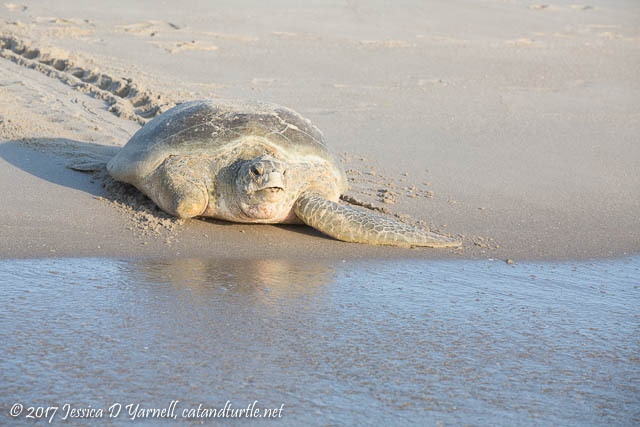 I headed into the water to photograph the turtle as she approached the waterline. It meant a good light angle for me and it kept me a good distance from her. I didn’t want to add to her stress. The poor thing dragged herself for a step or two, then heaved a sigh and rested. Often she’d close her eyes. But she did it. You could see the relief on her face as she got close to the water. 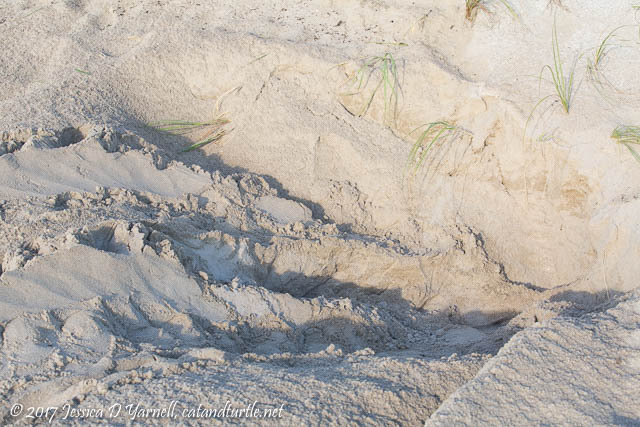 In the image above you can clearly see the tracks the turtle left in the sand. It’s possible to identify the type of turtle based on just the track. In our poor turtle’s case, her track is woefully one-sided due to her missing flipper. 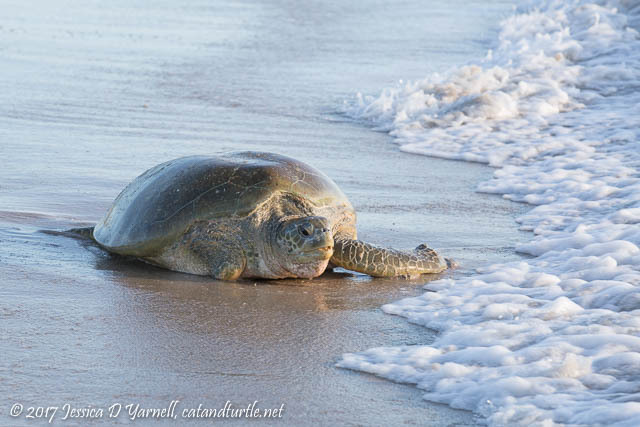 Even after the turtle hit the wet sand, it took her a while to get out into the waves. She seemed to welcome each splash of water, especially the one that cleaned all the sand off her face! This was my last view of our turtle before she became half-covered in waves. Due to her missing flipper, she got herself turned a little sideways. She sat patiently, waiting for a good strong wave to help carry her out to sea. When it finally came, she went under water and quickly disappeared. Home again! After wishing our turtle well, I walked back up the beach to take a picture of her nest. The babies will hatch in about two months and make their way to the sea, where they grow up by themselves. 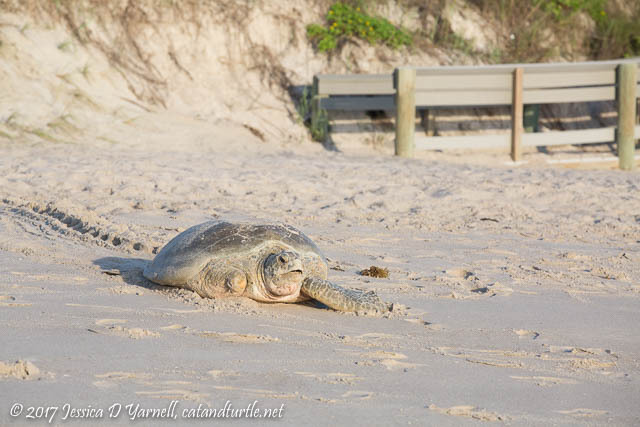 When it’s the baby turtle’s turn to nest, she returns to the same beach where she hatched. Pretty cool, huh? 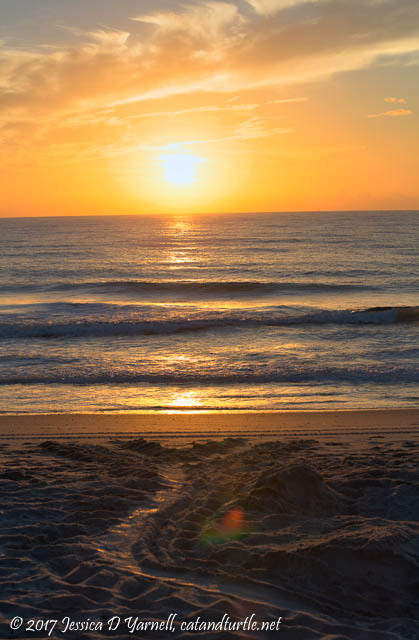 Even though the sun was blinding bright, I couldn’t resist taking one more photo of the tracks leading down to the ocean and into the rising sun. 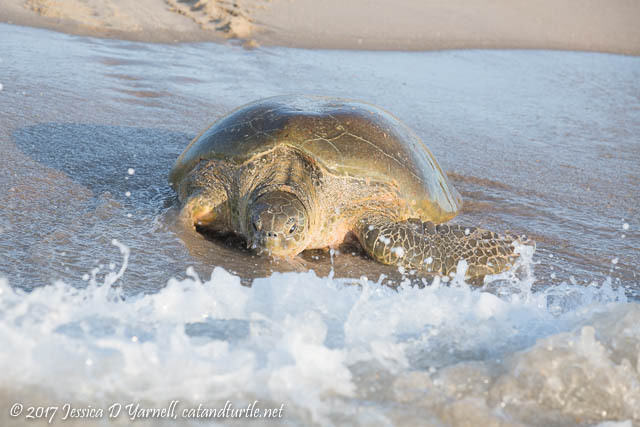 The turtles have followed this same pattern of nesting for millions of years. It makes you feel so tiny to stand on the beach and watch them continue their endless cycle of life. Gorgeous pictures and an amazing story. I’m sad that she’s missing a flipper but that doesn’t seem to be holding her back. Great job!